What a peculiar book this is. Most writers are content to stick to a few basic facts when turning in their Christmas themed manuscripts. These are the highly believable facts about Christmas, and we are happy with them. Not Jean de Brunhoff. 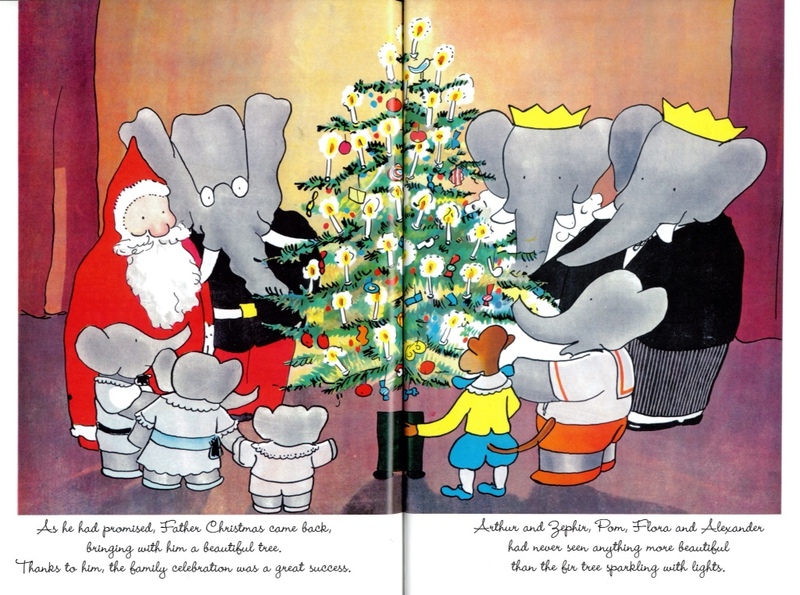 Babar and Father Christmas follows the dapper elephant king as he travels the world looking for the man in red. He wants to persuade him to add the land of the elephants to his Christmas Eve itinerary. But he’s a hard man to track down. Even France’s greatest scholars can only come up with a vague location, which turns out not to be Greenland, but somewhere near the Bohemain town of PRJMNESTWE. Accompanied by a dog called Duck, who claims to have a good nose for sniffing out the mythical present giver, they are accosted by a band of snow flinging gnomes, who turn out to be Santa’s helpers. 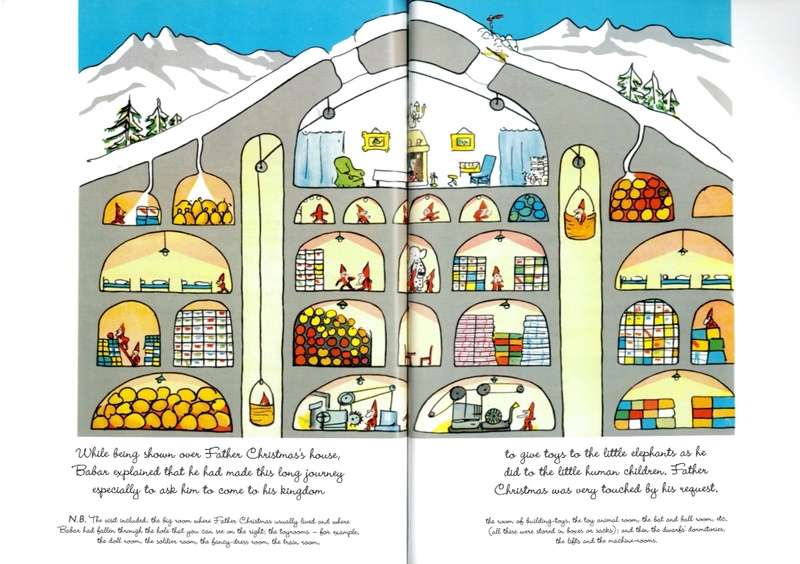 It is they, not the elves who run his underground lair (another great example of the Christmas cross-section). 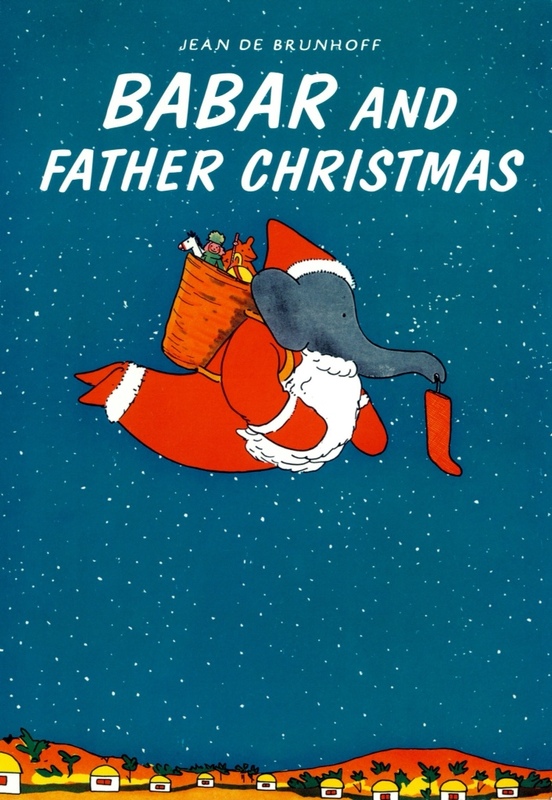 The Babar books come in for a lot of flak for their pro- Empire stance, this website offers an interesting reading of Father Christmas’s workhouse. 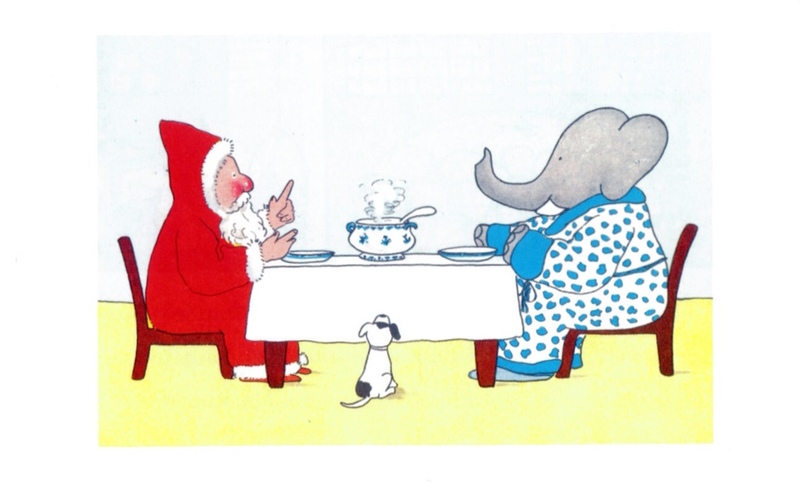 After some persuasion Babar gets Father Christmas to accompany him back to the land of the elephants. How do they get there? In a clam shaped car carried by a flock of seagulls of course. And so the old boy gets some quality R&R, riding zebras and snoozing in hammocks (‘as Dr. Capoulasse had advised him to do’), before heading back to PRJMNESTWE refreshed and ready to tackle another Christmas. 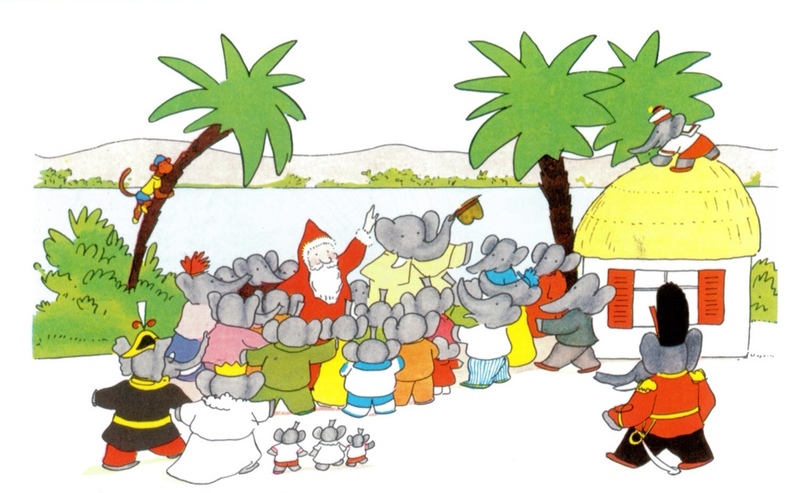 Babar is left to run the elephant arm of Father Christmas’s empire, donning his own flying Santa suit and delivering presents from a magic sack (le sac magique), that is always full of toys. Bonkers they may be, but I think prefer some of these oddball French innovations. I’m already saving up for a trip to snowy PRJMNESTWE.